Would you do yoga in a museum? What about in a museum with preserved human bodies? Well that's just what happened last weekend at the Menschen Museum in Berlin. The Menschen Museum (People Museum) was created by German anatomist Gunther von Hagens and opened in February 2015 directly in the middle of Berlin. Von Hagens is best known for his exhibition Body Worlds, which traveled around the globe showing people what goes on under the skin. Von Hagens invented a preservation process called plastination, in which donated bodies (with the donors full knowledge and consent) are embalmed, the skin removed, and then the body injected with a polymer that when dried, effectively turns the bodies to plastic. 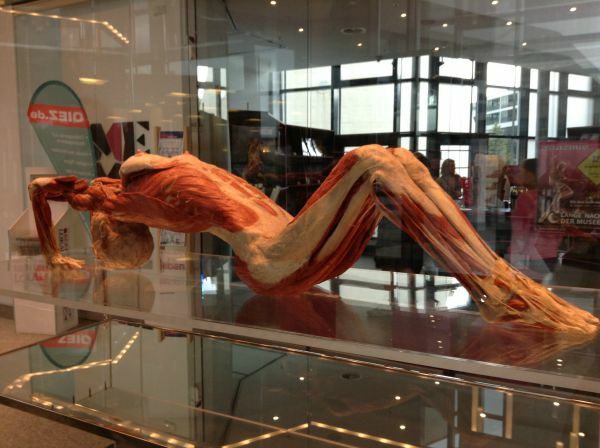 These bodies, or Plastinates, are posed and displayed in order to increase visitors' knowledge of health and human anatomy. Yogis With the "Yoga Lady"
The Plastinates are all displayed with respect, and there's even a memorial to them as you walk in. No details of who they were or how they passed are given. This creates an interesting atmosphere in the museum, as you're curious as to who they were and what caused their death, but their anonymity allows you to look at the Plastinates with a certain scientific objectivity. Last Saturday, the museum hosted a free yoga class to welcome their newest Plastinate, the Yoga Lady. The Yoga Lady has been posed prepping for Wheel Pose, and visitors can see exactly which muscles are engaged in the movement. "Knowledge of anatomy is important for the execution of the yoga practice. The participants at the yoga event can see exactly what happens under the skin when you move in great detail on the Yoga Lady and the other models, and then with this knowledge, be more aware of their muscles, joints, and correct body tension." Some might find the idea of practicing yoga in a museum with preserved bodies to be disrespectful or morbid. But to me, the idea of practicing around preserved bodies brings the concept of mortality and the fragility of life to the forefront. Yoga teaches us that all we have is this moment and this breath, and it seems that the Menschen Museum emphasizes that as well. After visiting the museum, I found it to be very much in line with yogic teachings and in-tune with a yogic lifestyle. The Menschen Museum is extremely focused on health and wellbeing, especially in our modern world. The audio tour repeatedly emphasizes the importance of a healthy lifestyle: low stress, nutritious food, exercise, and finding balance between work and play. All in all, I found it to be a great place to host a yoga event, especially if you're a yogi who's interested in anatomy. The Yoga Class with the "Yoga Lady"
What do you think? Would you do yoga in the Menschen Museum? Or do you think that's just too weird? Share with us in the comments below!